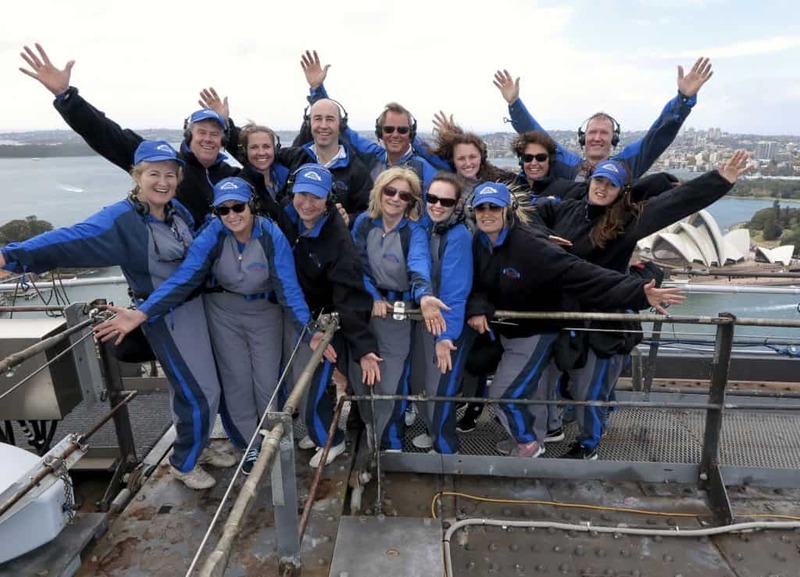 Sydney Harbour Bridge Climb is truly an experience that will not long be forgotten with BridgeClimb Sydney! The views alone are breathtaking and worth the trek. 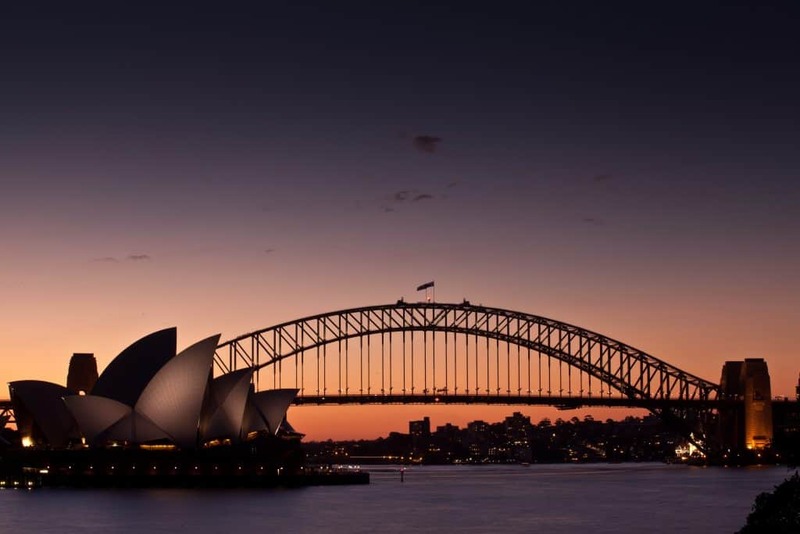 Will you put the Sydney Harbor Bridge Climb on YOUR bucket list? Apparently, I’m a bit out of touch. 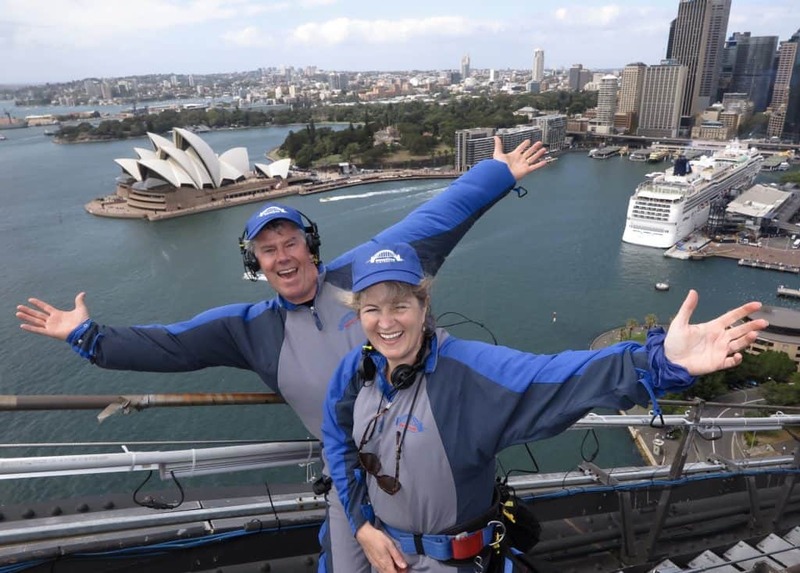 When I saw all the celebrities who have already done the Sydney Harbor Bridge Climb, I was really surprised! Who knew? 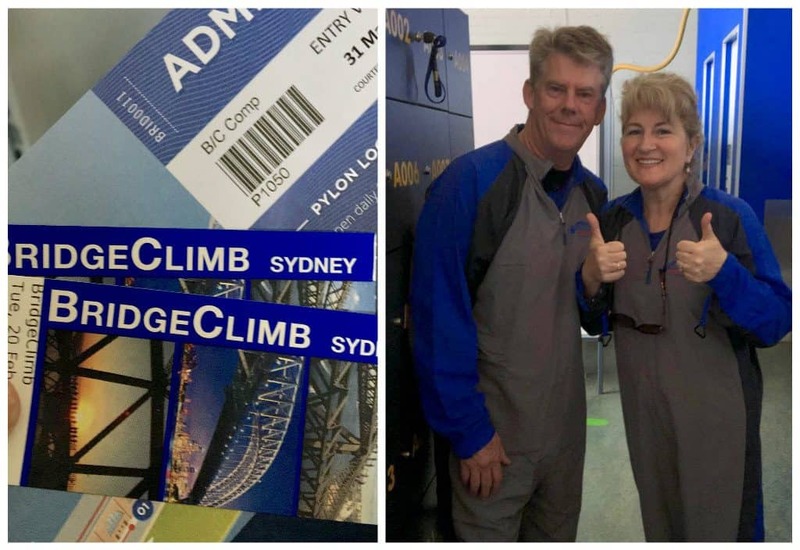 Disclosure: I was hosted by BridgeClimb Sydney for my experience. I paid full-price for my husband’s ticket. Auto Europe provided me with a 20% discount. All opinions are solely my own. 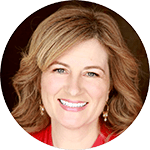 You might be following along on my trip Down Under which we booked on a whim. After seeing an incredible price on a Scott’s Cheap Flights email for flights to Auckland, we booked immediately. 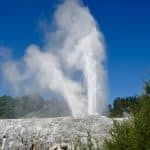 We had 6 days on a road trip in beautiful New Zealand seeing things like the Waitomo Glowworm Caves, exploring Tongariro National Park and Te Puia. We then flew to Sydney, rented a car through Auto Europe (yes, Australian rentals, too!) and headed south to visit relatives I’d never met in person! My mother has two first cousins who live outside of Sydney, and it was lovely to see everyone in person! 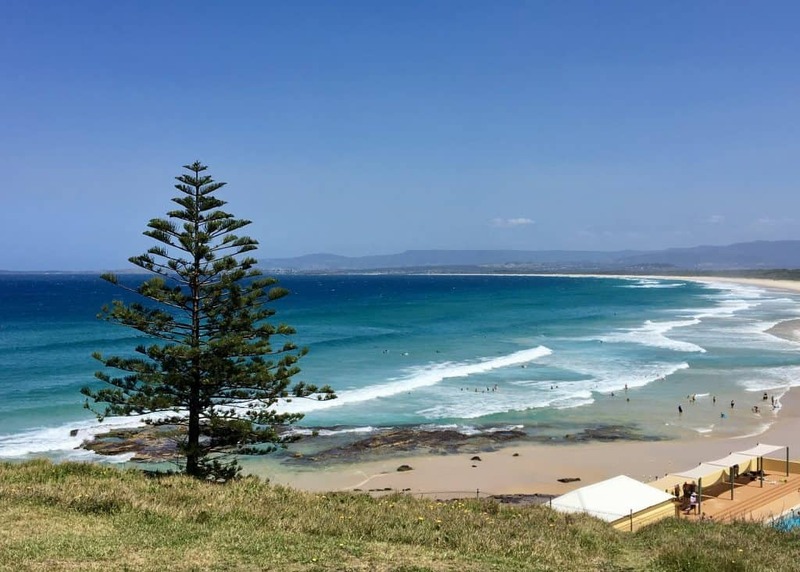 They were so gracious, and cousin Clara played lead tour director taking us to Wollongong, the beaches of Port Kembla and Kiama, among other places! When we were at the house, I spied some photos in my aunt and uncle’s living room! 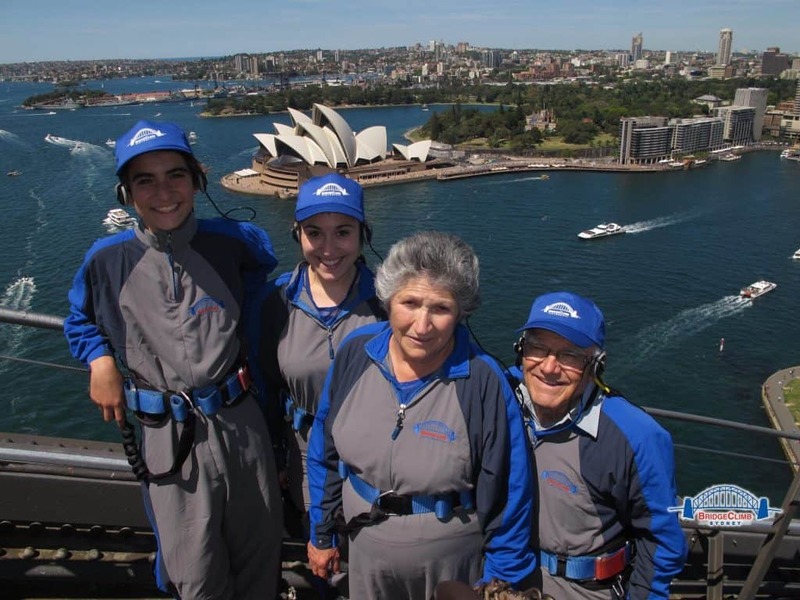 They had done the bridge climb 5 years before with two of their grandchildren! 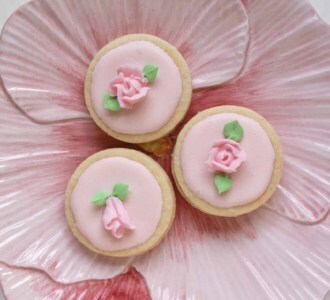 Aren’t these great? After our family weekend together, my husband and I drove back to Sydney and dropped our car off at the airport. 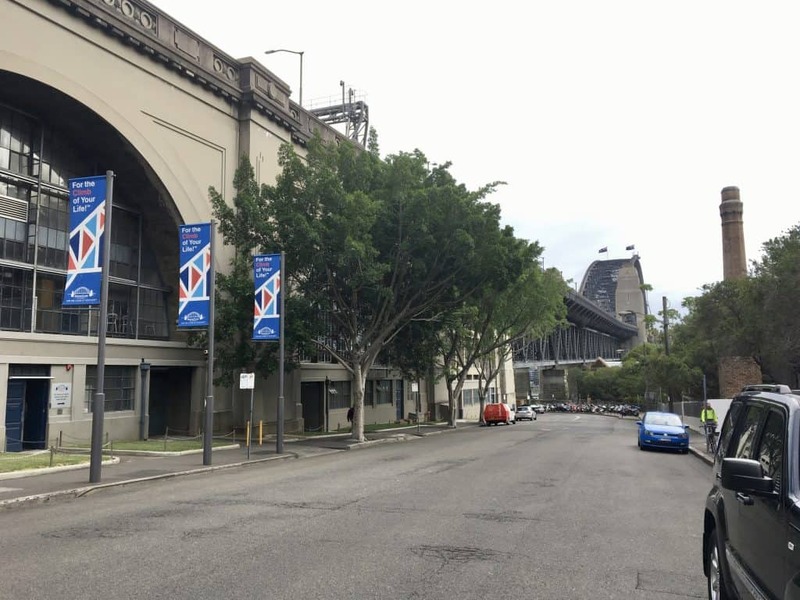 Like most cities, Sydney isn’t the best place to have a car. Parking rates are simply outrageous, just so you know. We grabbed a couple of Opal cards (public transport cards, like London’s Oyster card) and were on our way. 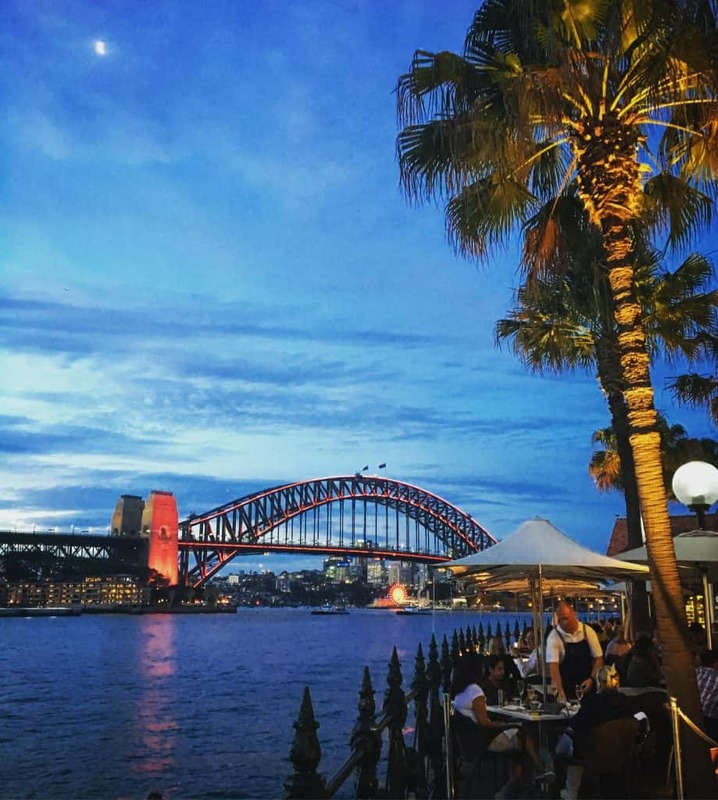 We checked into our hotel which was near Circular Quay, a fabulous location to be centrally located for sightseeing in Sydney. It’s basically between the Sydney Harbour Bridge and the Sydney Opera House. 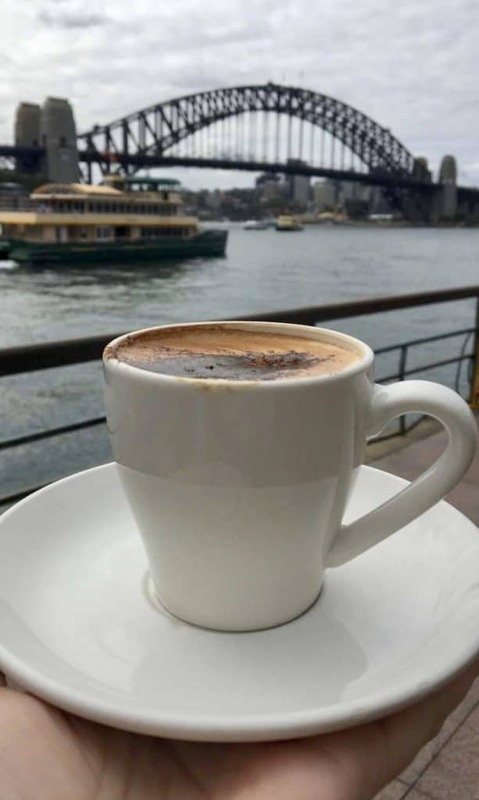 I also wanted to stay in the Circular Quay area because we had our reservation for the Sydney Harbor Bridge Climb the next morning. 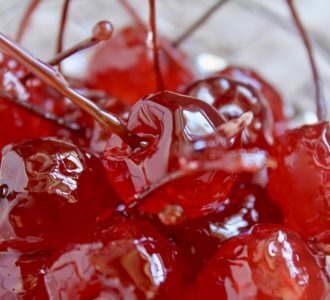 I was more excited than wary, but I have to admit, I wasn’t sure whether I’d get “jelly legs” up there, or not! Apparently, the team are great with guests who have a fear of heights. (I’m actually not too bad with heights, but some situations are not my cup of tea.) I’d also spoken to my friend Cathy from ShePaused4Thought who had already climbed the bridge (I had no idea) and she said it was a piece of cake. So, off we went in the morning, walking to a coffee shop for a light bite and hot beverage on the way to the Bridge Climb experience. 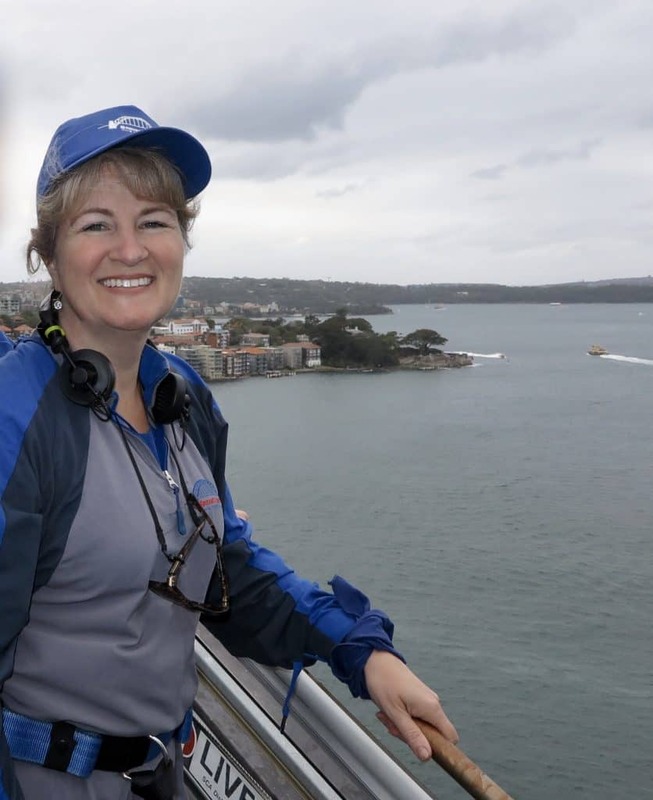 What’s it Like to do the Sydney Harbour Bridge Climb? 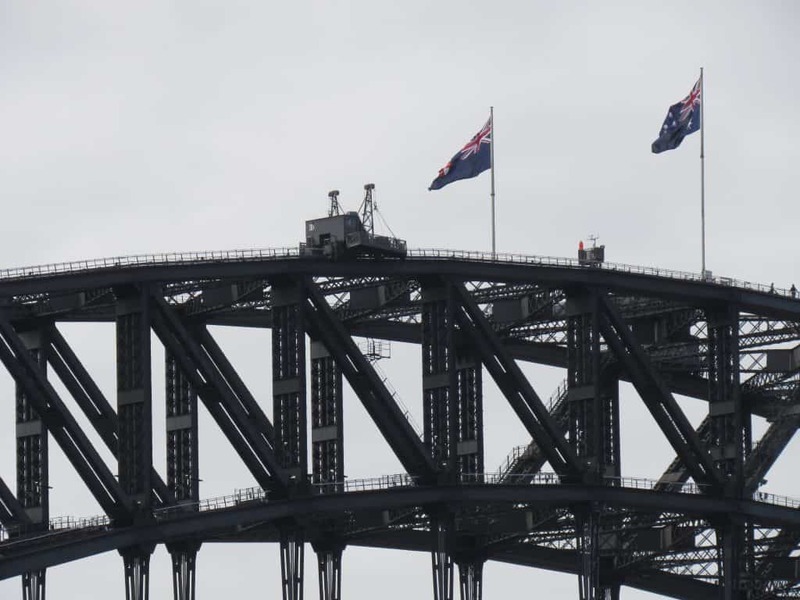 We didn’t have the best of luck with the weather during our trip Down Under, but the conditions truly could have been worse for climbing the bridge that day. We had a rather dull, overcast and very windy day, but look at this group’s photo! 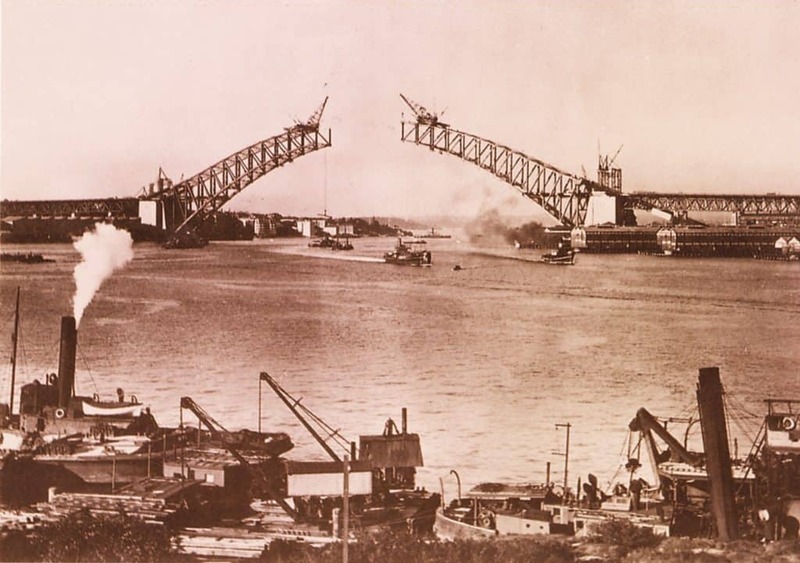 We arrived at the specified location, at the base of the beginning of the Sydney Harbour Bridge, a few minutes early. We had the morning climb scheduled, but I must admit, it was really difficult to choose which one to do! There are five types of climbs available, and they’re available at different times of the day. The dawn climb may have graced us with an amazing sunrise. Taking the afternoon climb could have been brighter and sunnier. The twilight climb might have provided a beautiful sunset and city views. I might just have to go back to do each one as it’s always a different experience! Then it was time to “suit-up”! We met Chris, who was going to be our climb leader. He was great, and led us through the procedures on getting ready for the climb. 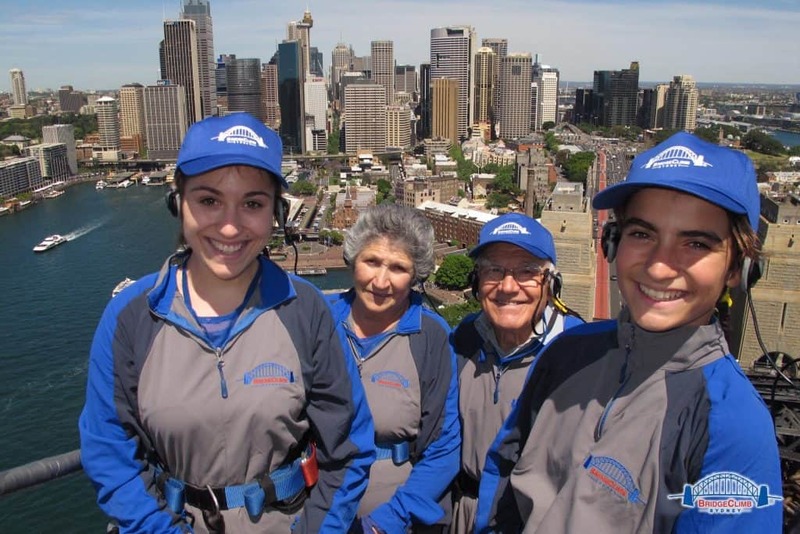 Everyone over the age of eight (climbers 8 to 15 years must be accompanied by an adult), in good health may climb the arches of the Sydney Harbour Bridge with BridgeClimb. 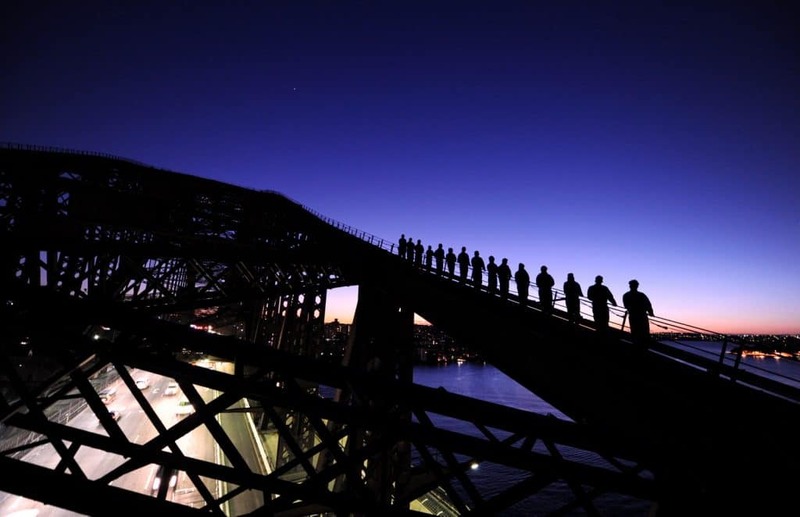 Most of all, safety is the number one priority at BridgeClimb Sydney. There’s even an indoor set of steps which is similar to the most strenuous stairs that are part of the Sydney Harbour Bridge Climb. It’s really not too difficult. Unless you have a health issue or have difficulty walking or going up stairs, you’ll be fine. Chris briefed us on what to expect and once we had all of our gear on (there are headsets, belts, hats and more). Next, we were ready to head out to the bridge! While we were walking to and on the bridge, Chris gave us a fantastic background on the history of the Sydney Harbour Bridge. It was truly interesting to learn so much about it, especially since he told us how the builders had no safety equipment. 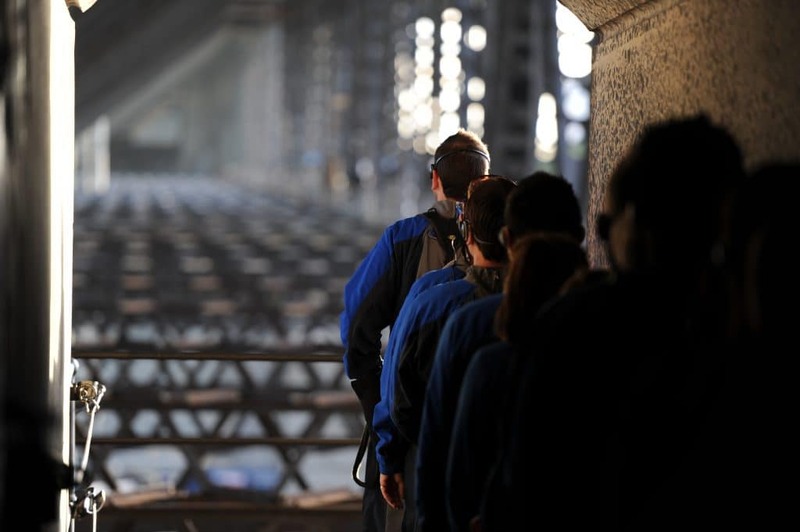 All guests are ATTACHED to the bridge at all times. I couldn’t imagine being up with with nothing as a safety precaution (especially since it was windy that day)! Unfortunately, some of the workers lost their lives. It was sad to imagine how terrible that would have been for those men and their families. This is where we ended up after navigating the stairs, which again, were not difficult to climb. Once we arrived at the top, Chris took photos of all of us, including a few group shots. No one had any qualms about being so high up even in such windy conditions. I don’t know the views make it all worthwhile, or the safety precautions help, but everyone loved the experience at the top! You can see how windy it was here! Eventually, we made our way back down after some time to take in the views at the top. The entire time you should allow to climb the bridge is about 3.5 to 4 hours. 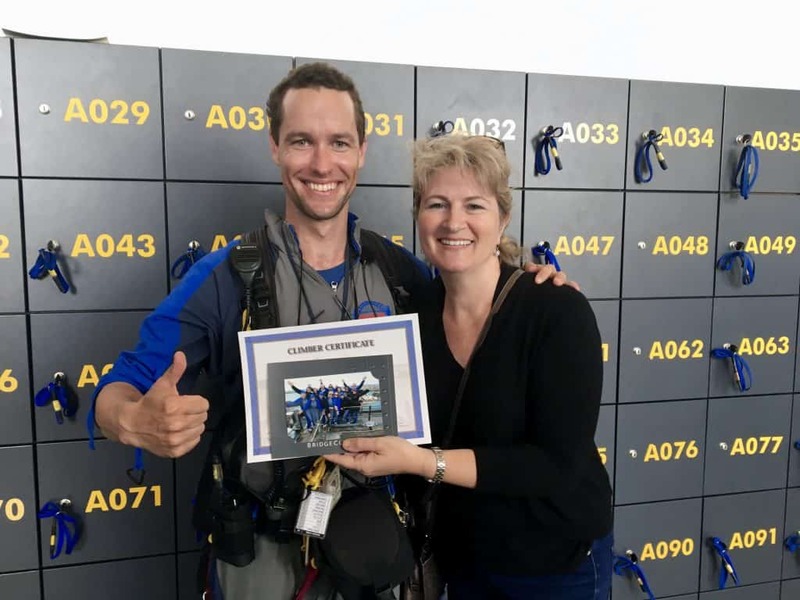 Once you are back at the Sydney Harbour Bridge Climb center, you will receive a certificate of your accomplishment and a group photo. Here’s Chris with me and my certificate! Other photos taken on the climb are available for purchase. 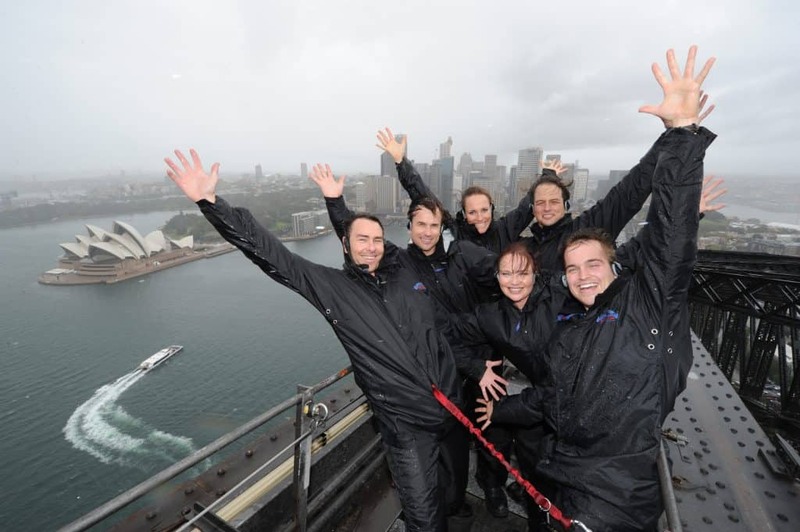 I would love to go back and do the BridgeClimb again! Maybe next time I’ll do a twilight or nighttime climb! What about you? 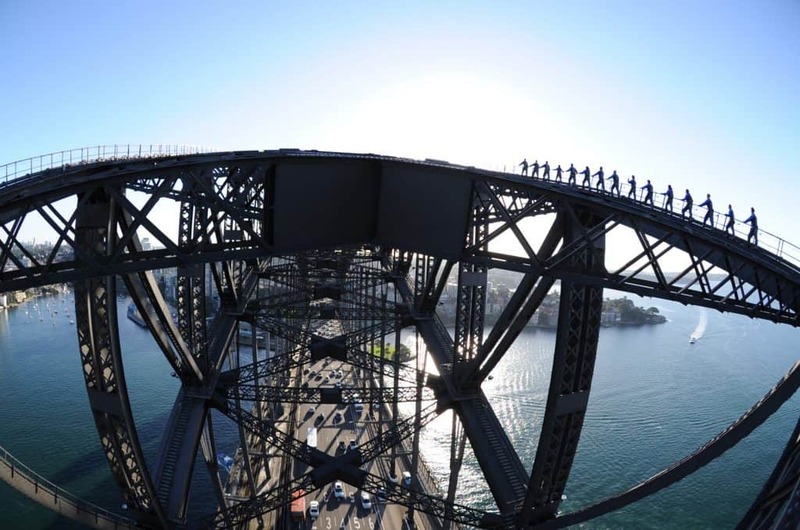 Have you already done the Sydney Harbour Bridge Climb? 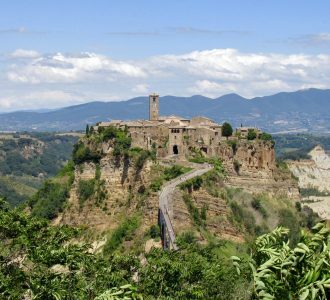 Have you heard of it and is it on your bucket list? Or is this your first time hearing about it? Let me know in the comments below! 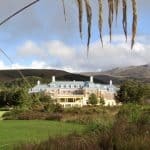 If you’d like more information or would like to book tickets, see the link below (not an affiliate link). Absolutely love that photo of you and Bob together. And good for you to go up there. Sounds an incredible experience but I’m glad just to enjoy your read on it, Christina. My cousin was proposed to up there! 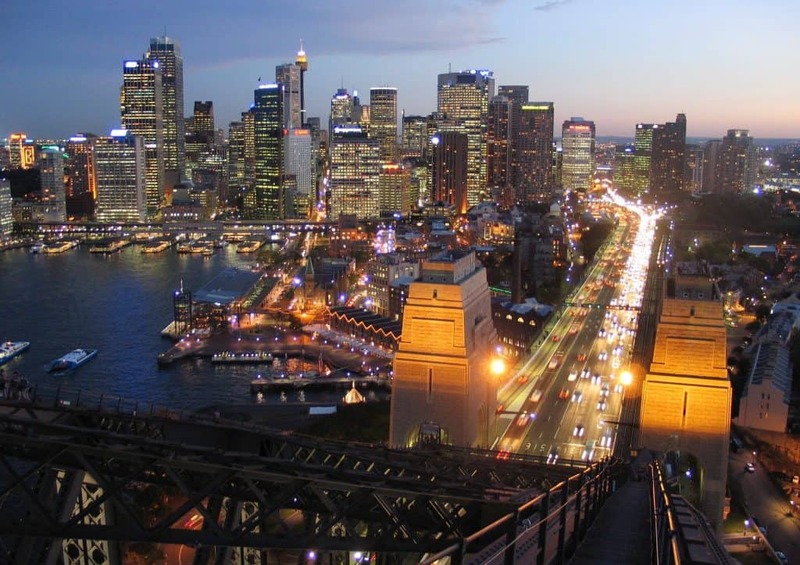 Sydney is one of those places that’s been on my “bucket list” for quite some time. Although with my acrophobia, I’m not sure I’d be up for a climb up the Sydney bridge… But I must say, the views do look spectacular! That sounds like such a buzz Christina. 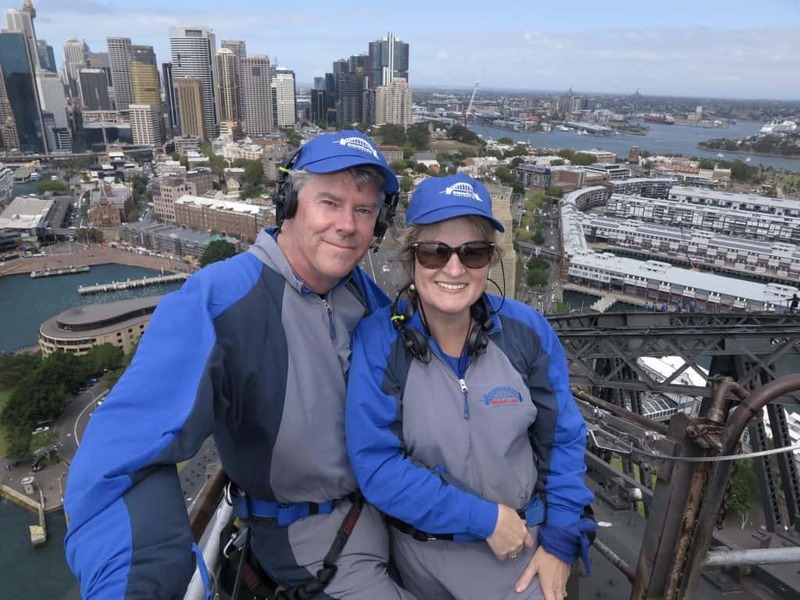 You’ve got some lovely photos of your bridge climb and what a way to remember your visit to Sydney! I am so glad you did it. What a bummer the weather didn’t cooperate, but it is such a fabulous place that even the weather couldn’t spoil the trip. Thank you so much for sharing your experience and it brought back wonderful memories of mine. And if my 78-year-old mother in law could do the bridge walk, I am sure most people could. It was still fabulous, Cathy! Yes, that’s about the same age as my uncle in the photo; I think it’s brilliant that they’ve done it! I’ve always wanted to do this! I did the climb out (and bungee down!) on the Macau Tower and also the tower in Auckland, and both were exhilarating but terrifying! 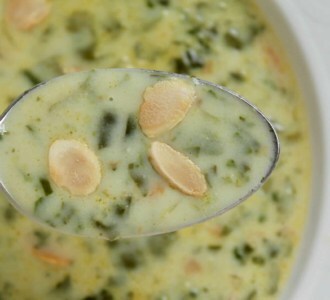 This sounds a tad bit milder, but still amazing. Wow! 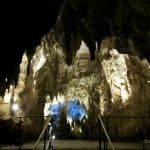 What an incredible experience – I can just imagine the views! I would DEFINITELY do this on a trip. I wish they did this on the Golden Gate Bridge as well! Wouldn’t that be awesome, Andi! Don’t miss it if you go to Sydney, though! What a cool experience!!! I always wondered what it was like! It’s fabulous, Marina! Definitely add it to your Australian bucket list! 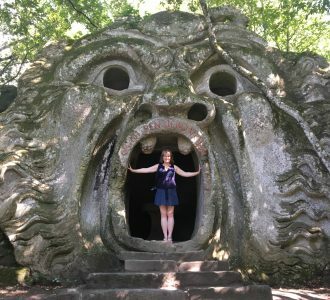 Two great experiences to have on your list, Laura! Absolutely loved both of them! A month in each country would be FABULOUS! Wow Christina what a fabulous trip. 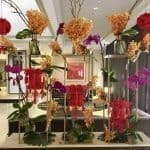 The photos are great, you do a fantastic job showing us the type of things that we could experience in other countries. 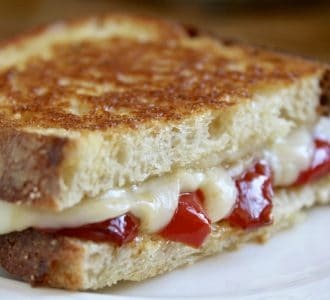 Not to mention the food to try. Love everything that you post. This is such a lovely comment, Lindsay! Thank you so much! When I really enjoy something, I just wish others can experience them, too! I need to go back to Australia as 9 days is simply too short! Beautiful! So nice that you could visit that beautiful country, love all your posts, thank you for sharing! Great to hear about your experience. 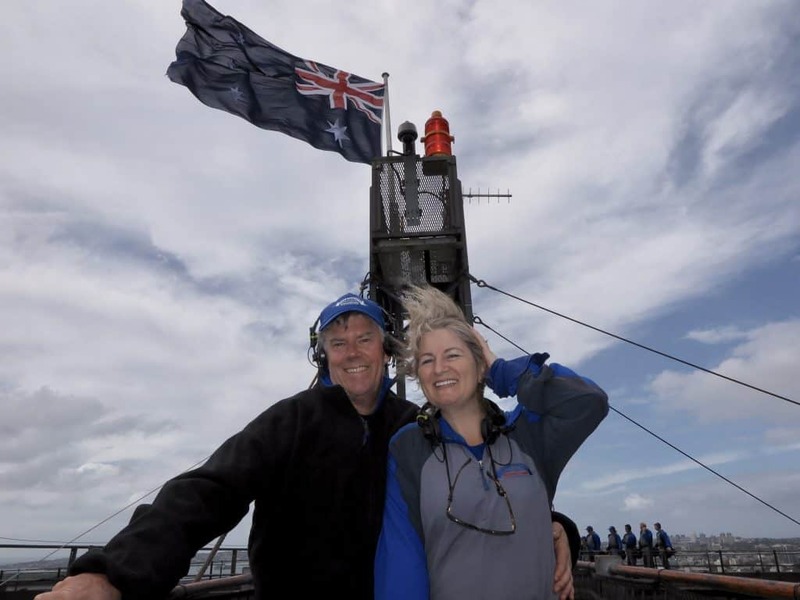 We thought about doing it when we were in Sydney about 8 years ago, but were in the middle of a nearly 3 week cruise tour and as it was pretty expensive we decided to use the money elsewhere. However, we did get to climb to the top of one of the bridge stone towers, which still gave us a pretty great view. If we ever get to go back, then I think I would splurge on doing it. You reminded me about the museum! Yes, it’s included in the Bridge Climb! I would recommend it-it’s really exhilarating!